What a horrendous 4 hours it had been. It is now 5:54 am. Dad woke up about 4 minutes after I finished writing this diary, he stood in the middle of the room swaying, I thought he was asleep. He was not. He turned round to me, shouted at me to turn my light on, so I did. He was green! He rushed in the bath room and sprayed forth a volume of vomit the likes of which I had never seen. He hadn’t shut the door so I saw and heard the whole thing. When he had finished being sick (luckily all in the bowl of the toilet) he came and stood in the middle of the room, just looking at me. “Oh Paul, I’m going to have a shocking night, I just know it”. We had gone from the relative calm of the Humber estuary to the north sea and the waters were rough. Very rough. Up and down, side to side and other combinations of movements. Cecil was running to the toilet every 15 – 20 minutes. To my surprise I didn’t feel in the least bit sick, but every time Dad retched I had to jam my fingers in my ears and wriggle them about so I couldn’t to hear him, but that didn’t really work. He had a travel sickness tablet at about 4 am and felt ok and got to sleep. Unlike me! The sea was still so rough I felt like I might be thrown from the bunk at any moment. I also feared the ferry would tip over in a Poseidon adventure style. I have been mapping out the ships ceilings in my mind and I think I could get out. Maybe. This may be one of the most ‘on edge’ nights sleep I have ever had. Literally with the pathetic width of this bed. Well we didn’t drown or die of vomit. I got about an hours sleep in total. And I had a splitting head ache all day. We got up at 7am (6am English time) and staggered to the restaurant for breakfast. Though I wasn’t really hungry for once. Dad was absolutely starving and ready for a meal. The boat had gone into calmer waters and was smoothly sailing along. I could only manage 20 slices of salami and that cheese with the holes in. Our coach driver hadn’t told us anything about what we do about getting back on the coach when the ferry reaches the port so we bumbled around confused, frightened and nauseous. As it turned out everything was announced by a robot voiced woman and we just followed the crowds. Though at one point Cecil walked off ahead and people started following him and he was going the wrong way. But how was he meant to know, there were no signs! Eventually we got back on the coach and set off at 9:30am. Nothing happened for 6 hours! Then we stopped at a service station in Luxemburg. Everyone who smoked rushed inside and we followed out of curiosity. In the shop were buckets of tobacco. You could buy actual buckets of the stuff. Unbelievable! But also there was the biggest jars of Nutella I had ever seen, they cost nearly 30 Euros. They were as big as my head! I really wanted one but Dad said we couldn’t afford it. So we just bought some smaller exotic looking snacks, such as chocolate covered waffles, some Milka thing with vanilla centers in, various crisps and mini salami type snacks. Then we were on the coach. Nothing happened until 6:12pm. And I’m still shaken by it now! Our coach driver (Bigglesworth, yes that’s his name, he is very posh) has never done this coach tour and he didn’t know where the hotel was, so he was blindly following the sat navs directions to the letter. This would nearly cost us our lives! We got near to where the hotel was, so the driver turned up this country road which wound up the side of a mountain. 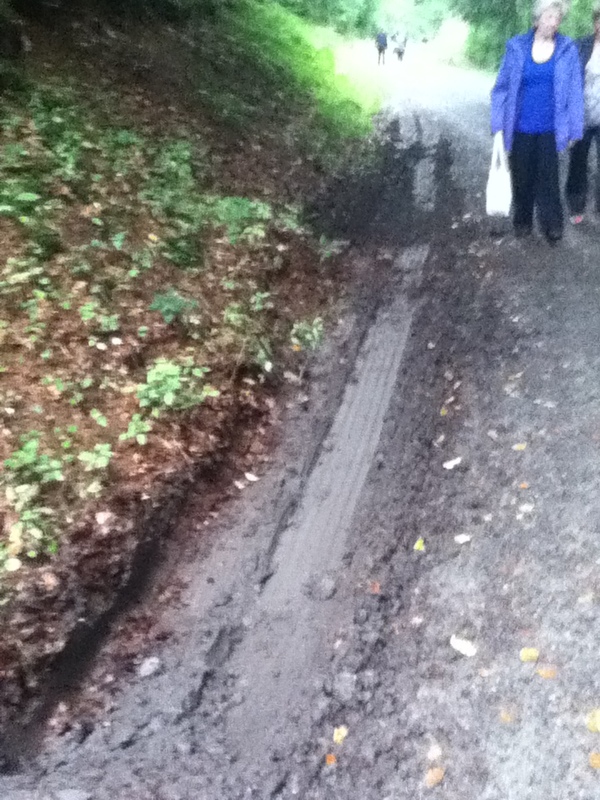 Everything was going well for 20 minutes or so, when the road ran out of tarmac and became a gravel track. That was the first hint that we should have turned back. But Bigglesworth pushed on. The track was about 1 foot wider than the coach, to one side was a steep bank leading up the mountain covered in trees, and to the right was a very steep drop down the mountain, with no trees in the way to catch us should the coach fall. Then some idiot shouted “oh God that’s one steep drop, are you sure this is the right way?”. This must have thrown Bigglesworth because he swerved and the whole bus tipped over. It had fallen into a ditch on the other side of the track, away from the shear drop, leaning towards the mountain side, but now we were stuck in mud. If I had to guess an angle the bus had tipped over to I would say it was now at about 30 degrees. People, mostly the old ladies, started screaming, though if the bus had tipped over it would have fallen against the trees and no one would have died. Bigglesworth did something with the gears and eventually got us free from the ditch. A big cheer went up, but there was no way to turn round so we had to press on up the mountain. After a while (and several close calls due to shear drops and bad road surfaces) an old woman screamed at Bigglesworth to let her off. She had a mini freak out and he asked everyone to leave the bus. Some of the old chaps directed him and the coach when he reached a field and he managed to turn round. Cecil had gone as white as a sheet and silent. Once he was off the bus he explained that he could see just how close to the edge we were (he was sat next to the window). Dad refused to get back on the bus as did several other biddies, so we had to hike down the damn mountain! It took us an hour, Cecil’s ankle started playing up so I had to find him a stick to rest on. Some of the other biddies started singing hiking songs. Dad joined in. I felt embarrassed. Eventually we got down the mountain and the bus was waiting for us. We got on and were met with foul looks from those who had dare stay on the coach. Sod them all the stupid silly old bastards, I hate them all! After another hour (Bigglesworth really hasn’t a clue) we made it to the hotel. Dad went and sat on a bench while I had to go get the suit cases. While I was stood waiting to get ours, a moronic blimp of an old man knocked over a rubbish bin at me (he bumped into it with his fat arse). The top was full of cigarette butts and water, so it all splashed over me. It stank of rancid water (egg) and rancid cigs. He didn’t even say sorry, or look round and see what he had done. I dragged the bags to our room which was of course on the very top floor (third) and looked out over nothing but a tree and another tree. There was also a massive spider in the shower which I gave a powerful wash.
Then it was half 7.30pm and time for tea. By this point we didn’t know if we were coming or going. We staggered into the restaurant and had to sit on a table for 6. I waited for the horrors of other old biddies joining us. I hate people at the best of times and this was one of the worse days I had had in quite some time. So the thought of having to make small talk with 4 old strangers was deeply unpleasant. So I sat there with a foul look on my fat face. Dad wasn’t talking, I think he was drained both physically and emotionally. That’s when we finally caught a break, the first of the holiday. All the stupid old bastards buggered off and no one sat with us! It was the happiest meal! I have never had a better meal in a foreign country. No small talk, we just sat there eating the salty meats. God knows what it was; it was slightly pink meat in bread crumbs with salty chips. Though pudding was some fruit in jelly so I gave that to Cecil. Both me and Dad are now sat on our beds writing our diaries. Though Dad had to stop because he said he felt like he was still at sea, as soon as he said it I also felt like I was bobbing up and down. I’ve just had a peek at Dad’s diary, it just reads “god, Germany hates me. I wish I was back in Blighty. Margaret, I love you” oh how touching! Our room is quite nice, but compact. There are 2 separate single beds but they have very thin duvets and the weirdest pillows I have ever experienced in my existence. They are about a meter square, but filled with feathers. Your head just sinks in them, I had to fold mine in three and it still went weird. The bathroom and toilet are all in one, there is no shower cubicle it’s a ‘wet room’ as Dad keeps calling it, “I’m just popping into the wet room to do a poopsicle” he keeps saying. What this means basically is that the floor of the room is all tiles and almost always wet and cold. I’ve gone through 3 pairs of socks (Dad’s socks) going in and out of there. There is a tiny TV in the room, it gets German TV obviously and also Sky News, though Dad has forbidden me from watching the news because he doesn’t want to think about England while he is away. There is also a hair dryer. I had to dry Dad’s socks with it, it was quite powerful! We don’t know where were going tomorrow, Bigglesworth hardly speaks, I don’t know when we go to Strasbourg. We have never had so little information from a driver. Normally you can’t shut them up. This holiday feels like it’s going to be very different, and mostly so far it’s tried to kill us thrice. That is if you can die from sea sickness or missing a train! Those crazy biddies I cant wait to hear what theyll do next, and how you will fare Paul! Bigglesworth should get the sack but if he’s quiet perhaps he is driving more safely than other verbose driver-tourguides.